The Clarets effectively declared themselves as a non-runner in the race to beat relegation in the Premier League after moving eight points clear of danger with a 3-1 win away at AFC Bournemouth. On the day of the Grand National, Sean Dyche's men took full advantage of Cardiff City's inactivity - due to Brighton's involvement in the semi-final of the FA Cup - to pile the pressure on Neil Warnock's Bluebirds. Burnley jumped to 14th in the table, climbing above Southampton, the Seagulls and Newcastle United, and moved within a couple of points of their opponents to all but assure their future at this level. The visitors got off to the worst possible start on the South Coast when an Ashley Barnes own goal gave the Cherries the advantage just four minutes in. 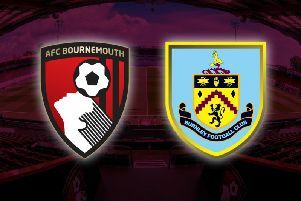 James Tarkowski conceded the set-piece 20 yards from goal when impeding Callum Wilson, allowing Ryan Fraser the opportunity to float the ball in to the box. The Scotland international's free kick was helped on by Jefferson Lerma and Barnes, who was caught on the wrong side of centre back Nathan Ake, flicked the ball past Tom Heaton and in to the corner. Eddie Howe's side were enjoying a spell of early pressure and Heaton did well to keep out Fraser's attempt down at his left hand upright soon after. David Brooks was showing glimpses of his ability when tucking in from the right hand side but the 21-year-old, signed from Sheffield United in the summer, should have given Heaton more of a test when picked out by Joshua King. The away side levelled in the 18th minute when Ashley Westwood's corner sailed over Asmir Begovic - in a similar fashion to the one that beat Brazilian stopper Allison at Anfield - and Chris Wood had the simple task of heading in his eighth Premier League goal of the season at the back post. The celebrations at the Vitality Stadium had only just started to quieten down when the Clarets turned things around. Dwight McNeil's cross was only half cleared by Chris Mepham at the near post and Westwood, who hadn't scored in nearly three years before last month's trip to Merseyside, fired home his second goal in four games in the top flight. As the game opened up, the hosts had an excellent opportunity to equalise when Callum Wilson had a free header from six yards out. However, having slipped away from Ben Mee to meet a Brooks delivery, the England international cleared the crossbar. Begovic turned Westwood's free kick around the post for a corner as the visitors regained control and Wood's looping header from Jeff Hendrick's assist dropped on to the roof of the net. Towards the end of the half it looked as though Martin Atkinson had a decision to make when King went to ground inside the area under the challenge of Matt Lowton. However, replays showed that the match official was right to be unmoved by the appeals for a spot kick with the Burnley right back making little or no contact. The away side carried on from where they had left off in the second half and Barnes almost added to the lead with a half-volley that crept just wide of the post after taking a nick off Ake. But the striker wouldn't be denied again when netting his 10th goal of the campaign in the 57th minute. Charlie Taylor did well to keep the ball in play down the left hand side, Wood beat Begovic to the cross and laid the ball off to his strike partner who made no mistake from close range. Mee headed over from McNeil's corner as the Clarets continued to look comfortable, a stance that didn't waver even when the home side forged two late chances. King glanced wide from Fraser's free kick and Wilson lifted the former Aberdeen winger's cross over the bar after creeping in-between Mee and Tarkowski.